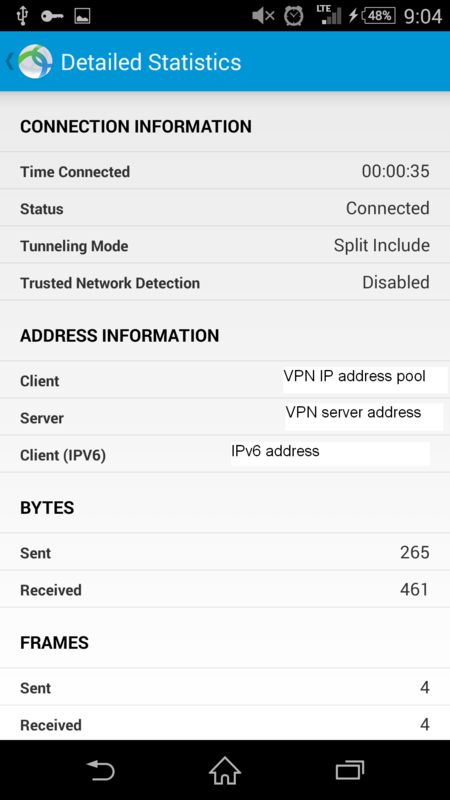 This post demonstrates how to set up anyconnect vpn for your mobile devices. In this post I am using an android mobile phone and downloaded anyconnect ICS+. Cisco ASA software version 9.1(4), ASDM version 7.1, with anyconnect essential license and anyconnect for mobile license. This demonstration will configure IPsec and SSL remote access VPN, using AAA and Certificate authentication respectively. User’s data to internal network will be tunnelled in VPN, other traffic will be through the internet. 1. Enable anyconnect on the outside interface of the Cisco ASA. 4. Enable trustpoint of the identity certificate on the outside interface. Anyconnect profile is in xml format, you can create a simple one using notepad. 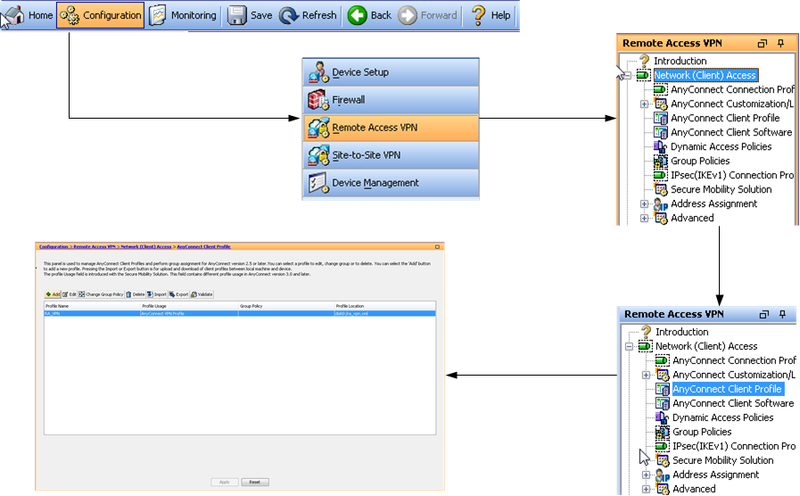 However you can create a complete on using ASDM anyconnect profile editor. For my case I used ASDM anyconnect profile editor. You can start your anyconnect profile by listing the available server list you intend to create, after which you can click on apply the command anyconnect profiles YOUR_PROFILE disk0:/YOUR_PROFILE.xml will be added for you in the webvpn section. Those commands that are required are highlighted. 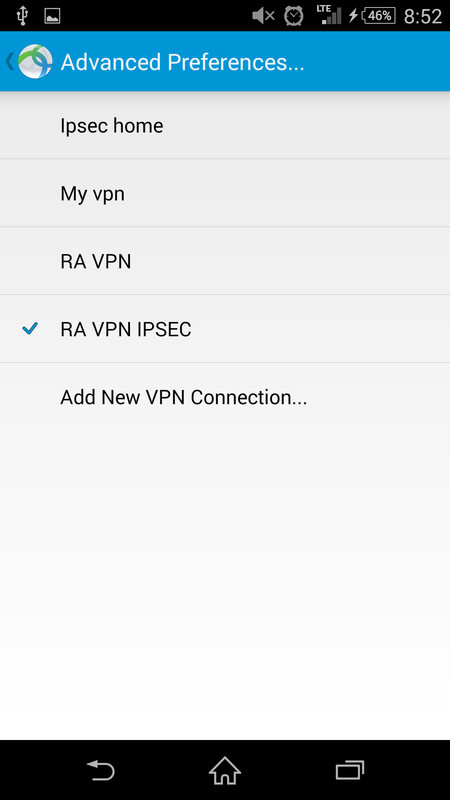 You do not need the anyconnect image to be installed in Cisco ASA for your mobile device to connect to VPN using anyconnect ICS+. IKEv2 phase 1 requires negotiation between server and client to setup phase 1 encrypted channel, the below are proposed encryption, integrity and DF group. Phase 1 is for authentication between peers. This is required so that inbound initiator can initiate phase 1 with Cisco ASA. For this setup I have made Cisco ASA to be a local certificate authority and issued itself a self-signed identity certificate as well as certificate for authentication. The trustpoint has to be pointed to the identity certs. Phase 2 is negotiated and setup under phase 1. The below is a list of proposal for phase 2 negotiation with inbound peers. The cypto dynamic-map is to attach the phase 2 proposal, this dynamic map is in turn attached to the crypto map and the crypto map is enabled on outside interface. !Attach phase 2 proposal to the dynamic map. !RA_VPN is the name of the dynamic map. !as long as the peer stays connected. !Enable crypto map on the outside interface. In group policy the default split tunnel policy is to tunnel all traffic to the vpn, however I can choose to exclude traffic to the vpn or specified the traffic I want to be sent through vpn, the interesting traffic is defined in ACL. In this setup if VPN user is sending data destined to the subnet or host specified in the split tunnel, the data will be sent through VPN, otherwise will be sent through public internet. Cisco ASA has a system generated default group policy, if no group policy is specified in your tunnel-group the default will be used. The default group policy however does not include ikev2, anyconnect requires ikev2. For this setup I have created my custom group-policy for both ipsec as well as ssl vpn. !Cisco ASA default group policy. This policy only defines protocol used. the group policy for SSL VPN. !Traffic destined to the network specified in the ACL will be through VPN. !Anyconnect profile created by ASDM anyconnect profile editor. The group policy for IPsec VPN. !anyconnect ipsec only requires ikev2, you do not need to follow this. !Data destined to the address in ACL will be sent via VPN. In this setup AD is used as the authentication server for IPsec VPN. !Define the aaa-server protocol first, in this setup is ldap. !Define the ip address of AD. !Define the domain name, in this setup the AD domain is testlab.local. !Active directory listing will be the entire forest. !sAMAccountName is the default attribute for Microsoft Active Directory. !Define the AD user account, in this setup I used the administrator user. The group policy will be attached to the tunnel group, if no group policy is defined, the default group policy will be used. Tunnel group for ssl vpn. !Define the group policy, if none is defined the default group policy is used. !Use certificate to authenticate, in ASDM this certificate is installed in CA Certificate. 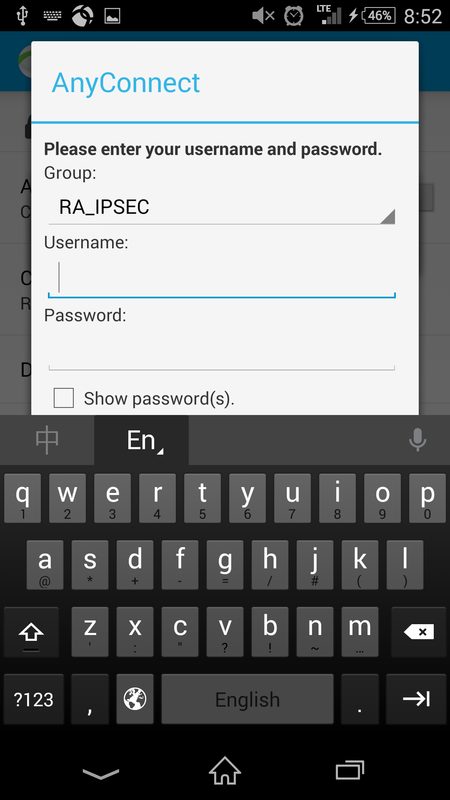 !VPN server address, and the user group, in this setup RA1 is the user group. Tunnel group for ipsec vpn. !AD is the authentication server in this setup. !group-alias that will appear on anyconnect client after connected. The anyconnect client downloads the anyconnect profile and update the server list in the client. If your anyconnect client could not see the updated server list, check your anyconnect profile or check if the group-policy has assigned a correct anyconnect profile or not. Tunneling Mode shows split include means traffic destined for subnet in ACL will be sent through VPN. Protocol and cipher used for the IPsec VPN. Secured routes show the subnet defined in the split tunnel ACL. Although it is known as SSL vpn, the protocol supported is TLSv1. This entry was posted in ASA/PIX, Firewall and tagged anyconnect, anyconnect for mobile, anyconnect ics+, asa, asa5500, ASA5505, cisco asa, cisco vpn, ipsec, ipsec vpn, ssl, ssl vpn, virtual private network, vpn. Bookmark the permalink. Awesome article. Resolved my issue.